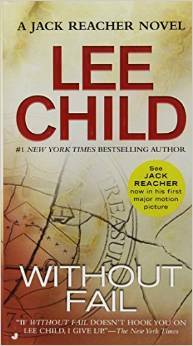 Continuing to work my way through the early Jack Reacher series, which I have in paper, but not electronically. I grabbed this one after starting it again in paper. Without Fail is almost a complete opposite to Running Blind. In this one Joe Reacher's former girlfriend finds Reacher and offers him a job. Check the Vice President-Elect's security. We know about an attempt on his life, but the Secret Service doesn't. However they've been getting threatening letters, including one in a director's office. They're worried. Reacher recruits Neagley, which makes this one of my favorites. I loved her in Bad Luck and Trouble, and I wish she were in more books. In this one she helps him penetrate the Vice President's security and then continues on as they investigate. It's a wild ride around the Secret Service, and as in many of the books, we are led in a direction different from what's happening. However it's a great read and quite exciting.